Here is the list of the hotels near Saint-Sorlin-en-Valloire. Book your hotel near Saint-Sorlin-en-Valloire today, Thursday 16 May for the best price, reservation and cancellation free of charge thanks to our partner Booking.com, leader in on-line hotels reservation. Below here is the list the 50 closest hotels of Saint-Sorlin-en-Valloire, sortable according your criteria. You will find the position of these accommodations on the Saint-Sorlin-en-Valloire hotels map. Holiday home chateaux du cros is situated in Anneyron and offers barbecue facilities. Guests may enjoy free WiFi. The holiday home comes with 2 bedrooms, a TV with satellite channels and a fully equipped kitchen that provides guests with an oven, a microwave, a washing machine and a toaster. Valence is 49 km from the holiday home. Grenoble - Isère Airport is 38 km away. Located in Manthes, Le Pic Boeuf provides free WiFi. All rooms are fitted with a terrace with city views. At the hotel, the rooms are equipped with a wardrobe and a flat-screen TV. The rooms have a private bathroom. Vienne is 45 km from Le Pic Boeuf. The nearest airport is Grenoble - Isère Airport, 29 km from the property. Offering a sun terrace and views of the garden, Chambre d'hôtes - Le Safran du Val d'Or is a B&B situated in Albon in the Rhône-Alps Region, 43 km from Valence. The property is set in a renovated farmhouse where saffron is grown and offers free private parking on site. Rooms have a private entrance and a flat-screen TV. Each room is fitted with a private bathroom. Le Safran du Val features free WiFi. There is a gift shop at the property. Guests can enjoy various activities in the surroundings, including cycling and hiking. Palais Idéal du Facteur Cheval is 15 km from Chambre d'hôtes - Le Safran du Val d'Or, Vienne is 31 km from the property and Peaugres is 22 km away. The nearest airport is Grenoble - Isère Airport, 36 km from the property. Located in Hauterives, 500 metres from "Palais Idéal du Facteur Cheval", B&B Chez L'Antiquaire features a sun terrace and a flowery garden where guests can relax. Free WiFi access is available in this B&B composed of guestrooms, an antique store and a cabinetmaking workshop. Each room offers a private entrance, a view, a flat-screen TV and air conditioning. The en suite bathroom is complete and comes with free toiletries. Baguettes and croissants are delivered each morning for guests to prepare their own breakfast. Tea and coffee making facilities as well as a refrigerator are available for guests and a restaurant can be found just 50 metres away. B&B Chez L'Antiquaire is within walking distance of Palais du Facteur Cheval. Hiking and biking paths are accessible from the property and free parking is available on site. Featuring an outdoor swimming pool and a garden, Chateau de la Saone offers B&B accommodation in Hauterives. This property also offers table tennis, a volleyball court and table football. Guestrooms feature views of the garden, a flat-screen TV, a desk and a complete bathroom. There is a shared lounge area, a library and free Wi-Fi access available. Breakfast including homemade cakes and jams, fresh pastries, breads and fruits is served every morning next to fireplace or in the garden, according to season. Meals featuring homemade goat cheese, seasonal products and produce from the garden can be prepared upon request and guests can also access the shared kitchen. Massages and babysitting services can be arranged at an extra charge. Palais Idéal du Facteur Cheval is 7 km away and the property offers free parking on site. Magnificent Renovated Farmhouse offers homestay accommodation in Anneyron, a 10-minute drive from A7 highway. Free WiFi is offered throughout the property and free private parking is available on site. The family suite has 2 bedrooms, a private bathroom, a living area and a dining room. Guests also have use of a heated, saltwater swimming pool and a games room. Towels and bed linen are provided. Breakfast is served in the suite and homemade meals can be prepared upon request. Lyon is 66 km from Magnificent Renovated Farmhouse, while Valence is a 45-minute drive away. Lyon-Saint Exupéry Airport is a 1-hour drive from the homestay and Grenoble-Isère Airport is a 40-minute drive away. Domaine des Buis is situated in the medieval village of Albon and is surrounded by the Drome’s hill. It offers en suite rooms with antique furniture and an outdoor swimming pool with sun beds and parasols. Provided with free Wi-Fi, each room at Domaine des Buis features a very spacious bathroom with hairdryer and bathrobe, an LCD TV and a garden view. Some of them have a fireplace and family rooms are available for those travelling with children. Croissants, juice and hot drinks are served for breakfast. Evening meals are also proposed in the refined dining room, upon prior reservation. The Château d'Albon is a 5-minute drive away and the famous stained glasses of St-Martin des Rosiers are 2.5 km away. Saint-Rambert-d’Albon Train Station is a 15-minute drive away and the A7 Motorway access is 13 km away. Located in the centre of Beaurepaire, Le Ponceau hotel has a restaurant and bar on site. It offers free Wi-Fi access and a meeting room for 20 people. Rooms at Le Ponceau are furnished with a wardrobe and desk and are equipped with a flat-screen TV. Each room has a private bathroom with a bath or shower, hairdryer and free toiletries. Buffet breakfast is served daily for a supplement. Guests can dine in the on-site restaurant which serves regional specialities, or take a drink in the hotel’s bar. Additional restaurants and bars are located 50 metres away and a supermarket is 500 metres from the property. Additional facilities at Le Ponceau include a games room with billiards and a 24-hour front desk. Fishing and cycling are available nearby and Postman Cheval's Ideal Palace is 11 km away in Hauterives. Vienne Train Station is 30 km away and Grenoble Airport is 25 km away. A bus, providing access to Vienne and Grenoble centre, stops 500 metres from the hotel. Located in Chanas, Gîte La Fraiseraie offers a heated, outdoor swimming pool with a pool house. Guests have access to a wellness centre with hot tub and sauna, and free Wi-Fi access is provided throughout the property. Set in a vegetable garden featuring several varieties of strawberries, this self-catering villa has a bathroom with walk-in shower and a seating area with a sofa and a flat-screen TV. Meals can be prepared in the kitchen, equipped with a microwave, oven and fridge, and vegetables from the garden are available for guests. A supermarket can be found within 3.5 km from Gîte La Fraiseraie. Free, private parking is possible on site. Guests may choose to visit St-Joseph Vineyard or explore Pilat National Park, both 5 and 15 km from the property. Located on a 120-acre estate, the Best Western Golf d'Albon is a paradise for nature enthusiasts, golfers and those who appreciate a relaxing holiday. The hotel hosts 2 golf courses - an 18-hole course and a 9-hole compact practice course. It also features a pro shop and an outdoor swimming pool. Guestrooms and junior suites are beautifully decorated and naturally bright. They provide guests with a comfortable living space that is fitted with comfortable furniture, modern amenities and free Wi-Fi internet access. The hotel restaurant, LAlbatros, is open daily for lunch and dinner (except Sunday evening) and features a varied menu of home-style cooking. Guests can dine on the outdoor terrace overlooking the golf course. La Méridienne des Collines provides accommodation with a garden and free WiFi. The bed and breakfast offers a flat-screen TV and a private bathroom with free toiletries, a hair dryer and shower. A terrace with garden views is offered in all units. La Méridienne des Collines offers a continental or buffet breakfast. At the accommodation you will find a restaurant serving French and Local cuisine. Cycling can be enjoyed nearby. Valence is 34 km from La Méridienne des Collines. The nearest airport is Grenoble - Isère Airport, 45 km from the property. Hotel Moissieu-sur-Dolon Preferred hotel ! Set in a 4-hectare park with century trees, this property has a seasonal outdoor pool. It is located in the Rhône-Alpes region, between Lyon, Valence and Grenoble Le Domaine de la Colombière offers individually decorated rooms featuring beautiful artwork. They include modern amenities such as free Wi-Fi internet access. The restaurant serves innovative cuisine made from fresh seasonal produce. Guests can choose from a range of set or à la carte meals. During fine weather, you can enjoy your meal on the lovely outdoor terrace. A buffet breakfast is served in the morning and features pastries, bread, cereals, jam, honey, a hot drink, fruit juice, cheese and ham. Meeting rooms are available at Le Domaine de la Colombière, in addition to table tennis and badminton facilities. Free parking is provided at Le Domaine de la Colombière, which is only 15 minutes from the exit of the A7 motorway. Mas du Golf is a detached villa situated next to a golf course in Albon in the Rhône-Alps Region, 43 km from Saint-Étienne. Guests benefit from free WiFi and private parking available on site. There is a seating area, a dining area and a kitchen as well as 5 bathrooms, each with free toiletries and a bath or shower. A flat-screen TV is provided. Other facilities at Mas du Golf include an outdoor pool. Valence and Vienne are both 38 km from Mas du Golf. The nearest airport is Grenoble - Isère Airport, 41 km from the property. Au Clos Beausejour provides accommodation with a seasonal outdoor swimming pool and free WiFi, and is situated in Chanas. There is a fully equipped private bathroom with shower and free toiletries. A continental breakfast is served daily at the property. The bed and breakfast offers a terrace. Guests can also relax in the garden or on the shared lounge area. Valence is 49 km from Au Clos Beausejour. The nearest airport is Grenoble - Isère Airport, 46 km from the property. Le Clos des Collières offers B&B accommodation and a self-catering apartment, located in the countryside of the Isère region. A covered swimming pool features in the large garden and free Wi-Fi is provided. Each of the individually decorated rooms feature a wardrobe and a private bathroom fitted with a shower. The 2-bedroom apartment includes a terrace, an equipped kitchen and a lounge with a TV. Guests staying in the rooms can enjoy homemade products and various kinds of bread for breakfast. Traditional meals can be prepared for dinner upon request, and there is a restaurant in the village. Le Grand-Serre, with its adventure park, is 9 km from this property and you can drive the 30 minutes to the city of Vienne. Free private parking is possible on site. This B&B is 65 km from Lyon St Exupéry Airport and 25 km from the A7 Motorway. On site you will also find the starting point of hiking and mountain biking paths. Hôtel balladins Lyon/Chanas is located a 5-minute drive from the A7 motorway and a 40-minute drive from the centre of Lyon. Free public parking is available on site and Valence is 49 km from the hotel. Guest rooms are equipped with free Wi-Fi internet access and satellite TV. They each provide an en suite bathroom with a shower. Breakfast is served each morning at the hotel. Additional facilities available include a restaurant and a children's playground on site. Ideally located near junction 12 on A7 highway and only 1 km away from the centre of Chanas, this hotel offers free WiFi and free private parking. Lyon is 50 km away. All rooms feature air conditioning, a desk, a flat-screen TV with satellite channels and a private bathroom. A continental breakfast is served every morning at the property. There is also an onsite restaurant. Saint-Étienne is 58 km from the property. Lyon-Saint Exupéry Airport Airport is a 50-minute drive from the property. The Mercure Vienne Sud Chanas is located 40 km south of Lyon, and 14 km from St Clair Golf Club. You can enjoy a drink at the bar. A TV, minibar and free Wi-Fi access feature in the guest rooms, which have a modern decoration. Each has a private bathroom with a hairdryer. Breakfast is prepared every morning at this hotel, and traditional French cuisine is served in the restaurant, Le Bistro. Mercure Vienne Sud Chanas is just 10 minutes from the famous Renaissance chateaux in this region. Free private parking is available on site. 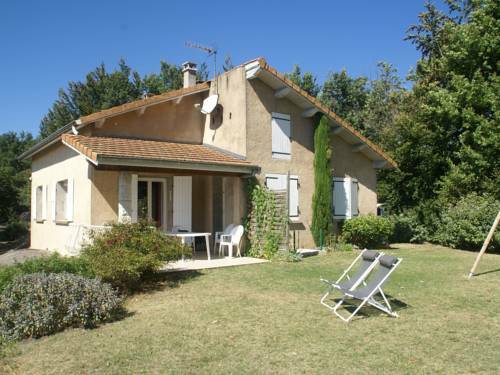 Maison De Vacances - Bathernay is set in Bathernay and offers barbecue facilities. Guests are welcome to enjoy the free WiFi. The holiday home includes 3 bedrooms, a kitchen with a dishwasher and an oven, as well as a coffee machine. A TV and DVD player are provided. The holiday home offers a children's playground. A terrace can be found at Maison De Vacances - Bathernay, along with a garden. Valence is 33 km from the accommodation. The nearest airport is Grenoble - Isère Airport, 44 km from Maison De Vacances - Bathernay. Les Lilas de Diane in Claveyson features free bikes and a garden. The guest house offers garden views and a terrace. All guest rooms in the guest house are equipped with a TV. All rooms have a private bathroom with free toiletries and a hair dryer. All rooms include a wardrobe. Guests at Les Lilas de Diane can enjoy a continental breakfast. Guests at the accommodation will be able to enjoy activities in and around Claveyson, like cycling. Valence is 32 km from Les Lilas de Diane, while Vienne is 50 km away. The nearest airport is Grenoble - Isère Airport, 46 km from the property. Situated in Montchenu in the Rhône-Alps region, Gite les pins is a 3-star property featuring free WiFi. The property has garden views. This holiday home comes with a kitchen, a seating area, and a flat-screen TV. The holiday home also comes with 1 bathroom with a shower. The holiday home offers a barbecue. A garden and a terrace are featured at Gite les pins. Valence is 42 km from the accommodation, while Romans-sur-Isère is 23 km away. The nearest airport is Grenoble - Isère Airport, 46 km from Gite les pins. With a private beach area and free bikes, Villa Rhôna is located in Andancette and offers free WiFi. There is a private bathroom with shower in all units, along with free toiletries and a hair dryer. A continental breakfast is available each morning at the property. The bed and breakfast offers an outdoor pool. Guests at Villa Rhôna can enjoy cycling nearby, or make the most of the garden. Valence is 45 km from the accommodation. The nearest airport is Grenoble - Isère Airport, 49 km from the property. Les Garennes is 2 km from the centre of Saint-Uze and 10 km from Saint-Vallier. It offers an outdoor swimming pool, a garden and free Wi-Fi access. A sauna is available at an extra cost. All rooms feature wooden floors and a terrace with mountain views. Some include a private bathroom with a bath or shower. A continental breakfast with homemade jam and bread is served every morning at Les Garennes. Local specialities can be enjoyed in the evening if you reserve in advance. This property has a children’s playground and a library. Guests can play table tennis on site and free private parking is available. Situated in Saint-Uze, Kergio offers accommodation with a private pool. Housed in a building dating from 1975, the bed and breakfast is in an area where guests can engage in activities such as cycling and table tennis. A continental breakfast is available each morning at the property. The bed and breakfast offers an outdoor pool. Guests can also relax in the shared lounge area. Valence is 37 km from Kergio, while Vienne is 48 km from the property. The nearest airport is Grenoble - Isère Airport, 48 km from the accommodation. Featuring accommodation with a terrace, Maison de Village Andance is situated in Andance. The property has river and city views. This holiday home features 5 bedrooms, a flat-screen TV, and a kitchen. Valence is 45 km from the holiday home, while Vienne is 37 km away. Grenoble - Isère Airport is 49 km from the property. Located in Saint-Désirat in the Rhône-Alps Region, this detached holiday home features a terrace and a garden with a seasonal outdoor pool. The unit is 37 km from Saint-Étienne. Free WiFi is offered . There is a seating area and a kitchen equipped with an oven. A flat-screen TV is featured. Guests have access to all the services provided at the Hôtel La Desirade, which is 4 minute walk away. You can play table tennis at the property, and the area is popular for hiking. Valence is 37 km from Gite La desirade, while Vienne is 31 km away. The nearest airport is Grenoble - Isère Airport, 44 km from the property. Hotel Saint-Désirat Preferred hotel ! The charming La Desirade is situated in the picturesque village of Saint Désirat in the heart of the St Joseph vineyard in the scenic Ardèche region. Set in a lovely park, La Desirade features a colourful décor with oak panelling, old fireplaces and antique furniture. The comfortable and spacious bedrooms are personalised and present cosy and characterful spaces. In the summertime, you can enjoy tasty local cuisine and regional specialities in the shaded park planted with 100-year old trees. There is also a local restaurant in the village centre, 400 metres from the property. Maison Gauthier is set in Saint-Désirat. The holiday home features pool views and is 49 km from Valence. The holiday home features a flat-screen TV and a living room. The holiday home offers an outdoor pool. Vienne is 40 km from Maison Gauthier. The nearest airport is Grenoble - Isère Airport, 53 km from the accommodation. Featuring barbecue facilities, Holiday Home Rue du Moulin features accommodation in Saint-Désirat with free WiFi and pool views. The property has garden views. The villa includes a kitchen with a dishwasher and an oven, as well as a coffee machine. A TV is featured. The villa offers an outdoor pool. Valence is 48 km from Holiday Home Rue du Moulin, while Vienne is 39 km away. The nearest airport is Grenoble - Isère Airport, 52 km from the property. Situated in Saint-Uze, Le maximilen features free WiFi. Guests can enjoy a selection of French cuisine in the in-house restaurant. At the hotel, all rooms come with a desk and a flat-screen TV. The private bathroom is fitted with a shower. Guest rooms feature a wardrobe. A continental breakfast is served every morning at the property. Le maximilen offers a sun terrace. Guests at the accommodation will be able to enjoy activities in and around Saint-Uze, like hiking. Valence is 35 km from Le maximilen. The nearest airport is Grenoble - Isère Airport, 50 km from the hotel. The hotel Schaeffer is located in Serrieres on the banks of the Rhone River. It offers air-conditioned and soundproofed rooms with Wi-Fi internet access. The restaurant serves regional, homemade cuisine in a dining area that offers views of the river. In the surrounding area guests will find the Peaugre animal park and the Alembic museum. Hotel Schaeffer is located 3 kilometres from the A7 motorway. Free public parking is available nearby and a private garage is available for a fee. This hotel sits on the bank of the Rhône River, in the city centre of Serrières. It offers modern soundproofed rooms with air conditioning, flat-screen satellite TV and en suite facilities. All the superior rooms located on the 1st floor have a balcony. The private bathrooms feature a hairdryer, a towel dryer and a shower or a bathtub. Hotel Monhotel also provides free Wi-Fi access and daily continental breakfast. Guests can relax with a drink at the bar, or on the covered terrace. Monhotel is 8.5 km from the Safari de Peaugres wildlife park and 8.2 km from the Alambic Jean Gauthier Distillery and Museum. Free on-street public parking is available is available nearby and the hotel also has a private garage parking for an extra charge. Bed and Breakfast Saint-Barthélemy-de-Vals Preferred hotel ! Below here is the hotels map of Saint-Sorlin-en-Valloire. Names and details of Saint-Sorlin-en-Valloire hotels can be shown on the map clicking on the prices icons.